During the last twenty years, many of you have heard me speak about teaching reading. 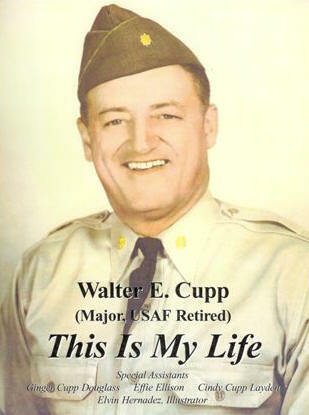 During these talks or training sessions, I have told stories about my father, Major Walter E. Cupp. My dad has been an inspiration to my sister, Ginger Douglass, and me, as well as hundreds of others. He died on March 22, 2003. Ginger and I would like this April Newsletter to be a tribute to this wonderful man. Daddy was very ill during November and December 2002. On January 1, 2003, he started writing his autobiography, and he finished his book on March 19. He died three days later. At his Memorial Service on Monday, March 24, the minister shared his Words of Wisdom from his autobiography. I would like to share the first two chapters of his book with you. Click here if you would like to read the entire text of his book. A special note of interest: Daddy’s book has twenty illustrations of his favorite stories. Elvin Hernandez made these illustrations. Elvin also illustrated the ThinkerBox™ Books. You should have been there when twenty-two-year-old Elvin sat on the floor in my father’s den (long hair flowing). Ninety-year-old Daddy told story after story, and Elvin illustrated. Daddy laughed and laughed. Daddy’s memory might not have been great on what happened yesterday, but when he talked about chasing the milk wagon at fifteen, he could give you every detail. This book is dedicated to my grandsons, Jeff, Tim, and Walt, and to my Eliza and all the future generations, in hopes my experiences will help them find their own way to happiness and success in their lives. I begin this autobiography on January 1, 2003. I am 90 years old and living in Savannah, Georgia. I’ve enjoyed a wonderful life. My health has been an issue over the years, but I have never let it slow me down. During the last two months, I have found out I have heart problems, and we are working to get me back on my feet. For the first time in my life, I can’t go and do, as I want to. I have some free time now and with the encouragement of family and friends, I have decided to write my autobiography. In my own words, This Is My Life. I will end each chapter with a few Words of Wisdom. These words of advice are not ones I have ever put on paper for anyone before. They are words that I have lived by. What is the old saying? It is not what I say that really tells about me, but what I do. I don’t know a lot about my mother and father. According to Alvin L. Anderson in a genealogy of the Anderson Family, my family tree can be followed back to 1838 when two immigrant brothers, John and Frederick Anderson emigrated from Oetisheim, Germany to northern Pennsylvania. Alvin Anderson writes about my grandfather, James Fred Cupp. James Fred Cupp, second child of George and Wilhelmina (Anderson) Cupp, was born February 7, 1858, and died in 1948. He married Christine Yoxheimer, who was born in 1862 and died in 1946. Eric Cupp, my father, was their second son born in 1887 and died in 1933. Eric married Emma Pauling, my mother. I had one brother, Ralph Cupp born in 1910. He is now dead. I was born on August 16, 1912. This picture was made right before we were sent to the orphanage. My recollections begin when I was six and my brother, Ralph, was eight. The year was 1918, and our mother died from the flu epidemic. We were sent to live in the Loysville Pennsylvania Orphan’s Home. We didn’t like the conditions at the orphanage; therefore, we packed our little bags and took off on the second or third day we were there. This period from 1918 until 1925 is still vague to me. Looking back on these years, my brother and I could not remember where we were or how we lived. Later on in life, my brother and I returned to the area of the orphanage and knocked on doors trying to find someone that might have remembered two little runaway kids. We could never find any information about these missing seven years. I am the cute one on the left. The pictures on the opposite page are the only ones I have from my childhood. You can see me with my brother, Ralph. I’m the one on the bicycle. We were little kids in the first pictures, and then the next pictures show me as a teenager. I don’t have any pictures from those missing seven years of my life. I remember meeting my father one time. He was a chef in a restaurant in Pennsylvania. When he died in 1933, someone called and told me. He was not part of my life. I don’t remember anything about my mother. I do remember we were sent to the orphanage soon after her death. My father had brothers and sisters and both my grandparents on my father’s side were alive when my brother and I were sent to the orphanage. I don’t remember any of them except my Aunt Mame. World War I was ending in 1918. This might have had something to do with why we were not taken in by family members. I really don’t know. The only thing I do know is my brother and I were basically on our own after we left the orphanage when I was six and he was eight. Words of Wisdom I am on the left. To end this chapter, I want my future generations to appreciate the homes and family they do have. No family is perfect. No family is exactly as it appears to be or exactly like all members would like for it to be. You should consider yourself lucky to have parents and others that love you and support you. If you don’t think you are getting from your family what you need or want, do something about it. You are given one life to live; live it to the fullest. When you are 90 years old, you will not want to look back and think of all the things you wish you had done. No excuses. Take responsibility for yourself and your actions at a young age and you will benefit from your successes and your failures the rest of your life. No one owes you anything. You need to earn respect. In 1926, I somehow had found a place to call home. A man named, William Steiger lived on a dairy farm and pasteurized the milk. He made individual deliveries to homes in a horse-drawn wagon. During this period of time, I lost contact with my brother. I am on the left. The lady is my Aunt Mame. My brother, Ralph, is on the right. My job on the Steiger farm was to herd the cattle, clean the stables, and assist in milking. My daily routine was to get up at 5:00 each morning, milk the cows, sterilize the milk, and get it ready for delivery. I would then go to school. The school was four to five miles from the farm, and I walked. This school was a one-room building and included all grades. I must have attended some type of school between the age of six and thirteen, but I don’t remember. I was a good student. During the field preparation and harvest changes, I did the duties that were appropriate to get the job done. This was my life from my 13th to my 18th birthday. With one added attraction, I bought a motorcycle--a Harley Davidson 45. Mr. Steiger’s farm was on hills; therefore, I purchased a motorcycle and used it to herd the animals. I might add that during this period on some weekends I would go to Harrisburg, Pennsylvania and hill climb and race the motorcycle. I competed in a big motorcycle race in Harrisburg, Pennsylvania. I never won, but it was always exciting. After a few years, Mr. Steiger would take me on his milk delivery route and show me the procedures. Mr. Steiger did this because he wanted to go hunting for deer and bear. At last, I was allowed to deliver the milk to several homes on my own. An interesting event occurred one day. The horse was trained in the delivery of milk to each customer. The horse allowed a minute or two to deliver the milk at each house. The horse never wavered on the transaction. On my first delivery something happened. When I knocked on the door, a lady showed up (minus some clothes), and this fifteen-year-old boy was caught in a bind. If I pursued the lady…the horse would move on without me…you guessed it. I had to run and catch up with the milk wagon. At age 18, I asked Mr. Steiger if he would act as my guardian and sign for me to join the United States Air Force. He agreed, and on February 12, 1930, I joined the Air Force. I was 18. 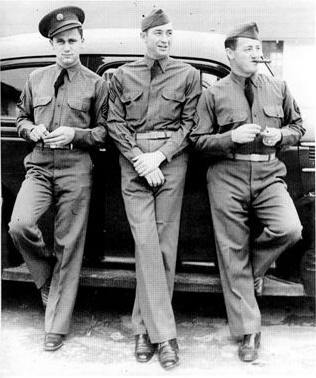 I am on the right with the cigar. This is my first memory of school. Yes, I really did walk to school in the snow. I didn’t mind the snow or the walk. I was thrilled to have the opportunity to learn. I greatly value education and learning. Spend your life learning and applying your knowledge and you will never be bored. Education will open doors for you during your entire life. Illustration of Walter Cupp chasing the milk wagon. If you would like to read the entire book please click here.